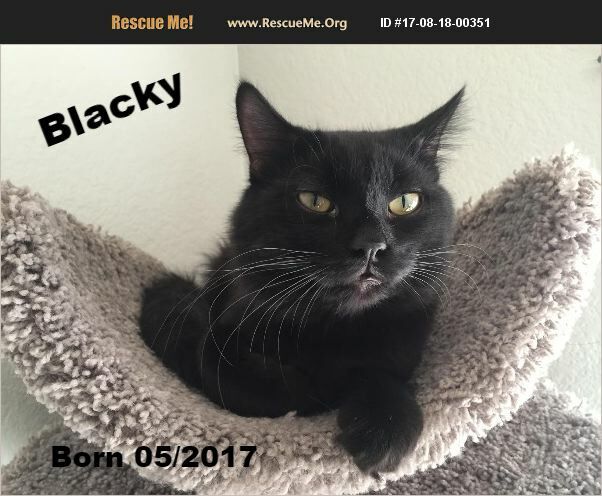 Blacky is a Male, 8 month old, DMH Black Kitten (Born: 05/2017). Blacky is a sweet little boy who LOVES to be pet. As soon as he sees you walk into the room he will strut right up to you and collapse at your feet to get a belly rub. He loves to play with all types of toys and is very energetic during playtime, little toy balls are his favorite. He gets along with other cats and is learning all about dogs in his new foster home. He has a huge heart and a meow that will make any stress you have melt away. He is timid in nature so would do best in a home with other chill animals that are happy go lucky like sweet Blacky. If you are interested in adopting Blacky, please complete the Cat Interest form on our website (www.azrain.org) and, if you are selected as a prospective adopter, we will contact you to set up a meet and greet with Blacky. Thank you for considering rescuing an animal in need. If you are interested in adopting any of our cats, please fill out an application by going to our website www.azrain.org and click on the ADOPT tab. Once submitted one of our adoption coordinators will review your application and contact you to set up meet and greets. Some of our Felines are located at PetSmart adoption centers: Chandler location at 2840 W Chandler Blvd. Tempe location at 1900 E Rio Salado Pkwy. Ahwatukee location at 4609 E Ray Rd. FOR ALL CAT QUESTIONS: CALL 614-385-2868 or EMAIL info@azrain.org. R.A.I.N. Rescue (Rescuing Animals in Need) is a 501c3 non-profit, all volunteer animal rescue. For more information on volunteer opportunities please go to www.azrain.org and click on HELP RAIN.